6pm.com - A sister site to Zappos, 6pm carries a lot of department store brands and items are priced high and low. You can find some great bargain with plus size clothing and shoes. Personally, I like to scoop up workout clothes from here. I also like to shop Rachel Pally here because it's usually marked down half or more. Hautelook - 3 words: SAMPLE SALE SITE - So this site will run a sample sale for about a week. They list a variety of items, but they do a plus size sale every couple of months. Sign up for the email notification, so you'll know when the plus sample sale is on it's way. I also buy a lot of home goods and beauty products here. Ideel - This used to be a sample sale site, but they turned into a regular shopping site. Find a lot of your favorite brands marked down, plus some brands you didn't know about. I bought my patent leather skirt from my birthday look here. Nordstrom Rack - Y'all know I know Nordstrom, but I love Nordstrom Rack too. I'm so glad they are online now. I cruise this site for quality leggings, large size shoes, and marked down City Chic. SaksOffFifth - Last year I scored a $700 Marina Rinaldi jacket for $75 from this site. (As you can see, I'm still happy about this moment). SaksOffFifth deeply discounts a lot of the high end brands they carry in Saks. One of the pricier of my "low" shopping, but this is a good place to get some of those special event cocktail dresses. 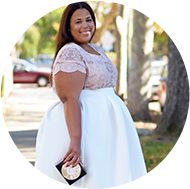 Rebdolls - I've worn quite a few of their pieces. Great for party clothes and I see they are doing more casual everyday pieces. They go up to a 4X and it isn't jr. sizing. I've said this before, but can't stress it enough. When I am shopping, I never look to clean up. I rarely buy more than 2 pieces of clothing at any store or website (except Asos lol) at even given time and usually never more than 5 - 7 from one store in an entire season (except Asos again LOL). I shop a variety of places and love to mix and match. I would look at these places just like that, multiple places you can mix and match. Also, some of these sites (and I think it's b/c of the markdown/budget aspect) don't showcase the clothing the best. Don't automatically discount the item. I would encourage to imagine the item on yourself as opposed to how it's being modeled. Sidenote: I didn't mention Forever21 for a couple of reasons. The first is that most people know about them. The second is that they are jr plus sizes that run small and a lot of people get sized out. I know there are a lot of pieces that I can't wear due to cut and I didn't want to state the obvious.